Can you beat the Irish Lottery? CLICK HERE! The Delta Lotto system is a powerful FREE lottery system that improves the odds of playing your favorite Ireland lottery, lotto and Keno games by dramatically reducing the number of digits you have to pick from. For example, to play the Irish Lotto game, you need to pick 6 numbers from 1 to 40. QUESTION: what if you could pick your Irish Lotto lottery ticket from just 13 numbers instead of 40? You think there might be a better chance of hitting a winning pick? 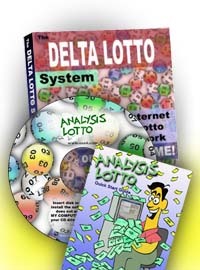 Below is a specific analysis of the Irish lottery games, the maximum Delta numbers to use for calculations, and websites where past lottery data can be found for use with the Analysis Lottery software. A FREE version of our Delta Lottery Calculator you can try with the Irish lottery games can be found here. Setup: 6 from 1-45 plus bonus from 1-45, DON'T repeat. Past drawing info at this site cannot easily be copied. Look instead at the ALL LOTTO DATA pages, some of which cover the Ireland lottery games. Start Analysis Lotto, and make sure the right game is loaded. Choose IMPORT LOTTO NUMBERS from the menu. Click PASTE on the Analysis Lotto IMPORT panel. Make sure both "intelligent import" and "reverse" boxes are checked, and press GO. If the numbers are successfully recognized, press ADD or REPLACE to add the numbers to your database. Setup: 12 from 1-24 , DON'T repeat. High Delta: 4 (Most Deltas will be lower than this number) What's a Delta? Click HERE. High Delta: 19 (Most Deltas will be lower than this number). What's a Delta? Click HERE. High Delta: 15 (Most Deltas will be lower than this number). What's a Delta? Click HERE.